The Last Jedi is still months away from hitting theaters, but it has become abundantly clear that there is already a backlash developing over the Porgs. Yes, the cute and cuddly little creatures that are taking over every toy store all over the world are starting to become a problem for a certain section of diehard Star Wars fans and one fan has taken it upon himself to draft up a disturbing poster that glorifies violence towards the Porgs. Many have worried that the Porg was going to become the new Ewok and a lot of the new promotional material and marketing for the movie have certainly started swaying that way, which is making the backlash intensify. Early promotional material for the movie featured the puffin/otter creatures hanging around on R2-D2 and Chewbacca, which is when the speculation started that Lucasfilm may in fact be marketing the movie towards children and not 47 year olds who remember waiting in line to see A New Hope in 1977. Once the Ewok angle started to spread, the internet started to turn on the adorable little Porgs and one Star Wars fan has taken it upon himself to possibly start a Porg war. Though nobody has seen The Last Jedi yet, it has become a collective fear that the Porgs will take over Rian Johnson's movie. 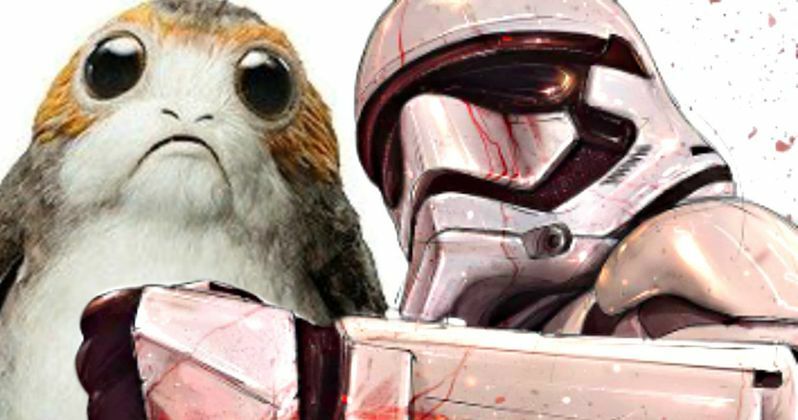 Star Wars fan and artist, Shane Molina, seems to have had it with Porg mania and drafted up a disturbing poster of a decapitated Porg at the hands of a First Order Stormtrooper. The poster comes to us via the Hawaiian Mako Design Instagram page and it is not for the faint of heart. The incredibly detailed poster features a First Order Stormtrooper holding the head of a Porg in his right hand with a bloodied knife in the left with some Porg guts dripping from it. The gruesome image looks like a scene from Predator. Comments below the image encourage the violence towards the Porgs with more than one person saying, "Kill all the Porgs." Not much is known about the Porgs at this time other than the sounds that they make and that they're the guardians of Ahch-To, which is the ancient Jedi Temple that Luke Skywalker has been in for the last 30 years or so. They also fly, make nests, and have razor sharp teeth. There are other inhabitants of Ahch-To, but so far, the Porgs are the standout, which is making a lot of diehard fans nervous that we could be in for Return of the Jedi all over again and that is not acceptable. Fans should take some comfort in knowing that The Last Jedi looks a lot more like The Empire Strikes Back and is described as a darker movie by director Rian Johnson. Star Wars: The Last Jedi has yet to be seen by anyone and yet the Porg wars have begun before even giving them a chance. Star Wars, after all, is mainly for kids and so what if they're a blatant marketing ploy? Everybody is still going to give Lucasfilm and Disney their hard-earned cash to watch The Last Jedi. Maybe it'll just take the next generation's Jar Jar Binks to make the cynics appreciate the Porgs after the fact. While we wait to see just exactly what the Porgs are all about, you can check out the disturbing fan poster below, but we must warn you, it is graphic.